Imagery abounds. 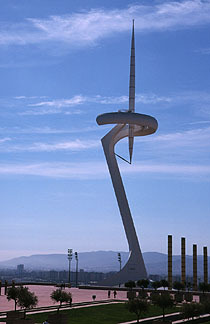 The overall form of the tower is based on a Calatrava sketch of a kneeling figure making an offering. The base on which the figure 'kneels' is covered in broken glazed tiles in recognition of Gaudi (though with more restrained colors). 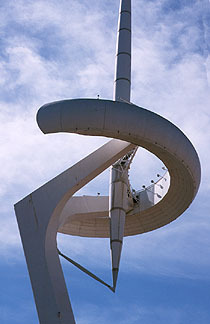 The orientation of the tower means that the shadow of the central needle on the circular platform acts as a (rather impractical) sundial. 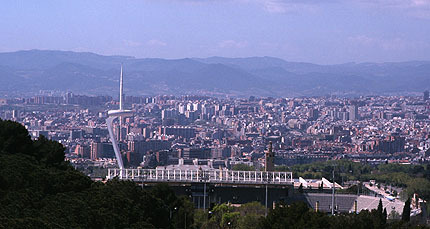 The tower forms part of the Olympic Ring complex in Montjuïc park, close to the Olympic Stadium. You can reach it with least effort by taking the Funicular de Montjuïc. Or take Metro lines 1 or 3 to Espanya station. Combine a visit with Mies' German pavilion a few minutes' walk away.